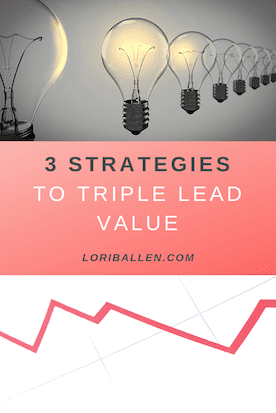 In this video, Ryan Deiss shares 3 strategies he has used to triple the lead value of his leads at Digital Marketer. This is a Facebook Live Video from the Affiliate Marketing Summit in Las Vegas, 2019. Find my commentary and take aways below. Increasing the value of our leads allows us to convert more leads and make more ROI on our ad spend. I personally bring in more leads through search engine optimization and social influence, yet those are still investments of time and money. Ryan Deiss shares that cost per acquisition has increased. He polled the audience and most reported that the cost to buy traffic has gone up. Facebook has reported having more advertisers than space for them to advertise. Supply and demand has increased the price of a Facebook Ad. The average landing page conversion rate is 2.35%, reported Ryan. Strategies that once well, have changed. The law of diminishing returns is at play in the world of digital marketing. It’s more important than ever to apply purpose to our marketing strategies. The nice thing about a more complicated market is that there is more room to rise to the top. Those of us that apply purpose can truly take advantage of a competitive market. When it gets hard, many will leave. This is where there is massive opportunity. While strategy will always have an advantage, Ryan shares that the secret to success in business is being able and willing to spend more than your competition to acquire a customer. High value segmentation is the art of finding your ideal customer for a service or product and targeting and messaging appropriately to convert more of that valuable group. Testing and measuring ads, calls to action, landing pages etc. and knowing how they convert is the secret to increasing conversion and lowering the cost per acquisition. In Ryan’s video above, which I highly encourage you watching, Ryan shares how asking one question related to the size of the person’s team REDUCED the conversion rate of the landing page (Lead Magnet). It was a simple radio button, but just asking that question stopped people. The more fields you require and questions you ask, the lower the conversion rate will probably be for that page. (Conversion rate is the number of people that land on that page divided by the number of people that register for the offer (or make a purchase)). This is why measuring for conversion and using heatmaps to measure page performance is so important. Ryan suggests using a binary option. A simple option “are you THIS, or THAT” to identify your high value segments. You’ll be able to reduce the friction and move peolple easier through a funnel. It will improve lead routing and increase sales. In this portion, Ryan talks about answering specific questions. And importantly, answering the questions specifically. This is something my team and I have been teaching for years. The more directly you can answer a customers question via a blog or video, the better you will do. Ryan suggests that the answer should not be “it depends”. It should be specific. Wondering where to find questions? It’s also important to remember to focus on the newcomers. As we get smarter in our industry, we often forget to speak the language of our original following. Pick 10-20 questions on Quora and record a video each one. Don’t elaborate, speak in absolute. Make it a short, purposeful answer. Be direct. Ryan suggests 1-2 minutes. On another note, Neil Patel, the day before, suggested his best videos are 5-7 minutes long (for ranking on Youtube). Ryan also suggested that native video performs well on LinkedIn which is more of a B2B network. Stop having people jump through hoops and allow them to just give you the money. Funnels work, but we need to “fast pass” the ones that actually want to just sign up. While many of us gravitate to online marketing to AVOID talking to people, conversion comes in when we ACTUALLY talk to them. Ryan calls Cost Per Conversation CPC (instead of cost per click). Chatbots are designed to engage your website visitor and automate the process of qualifying the lead. They don’t replace humans in the process. Instead of having the chat pop up asking “want to chat?”, Ryan suggests starting the conversation with a binary question as in the landing pages. “Are you THIS or THAT”? An example for real estate would be “Are you a Buyer or a Seller?”. You might want to skip putting the chatbot on the home page. Maybe only on particular pages. You can also set the bot to be offered only at the bottom of the funnel, or after a certain number of visits. Binary Question – Are you This or That? The important component to all of this is still humans. At a certain level, a human should jump in and take over. This is still the key to conversion.